In the case of Indian cuisine, besan should be called all-purpose flour instead of Maida! besan recipes. 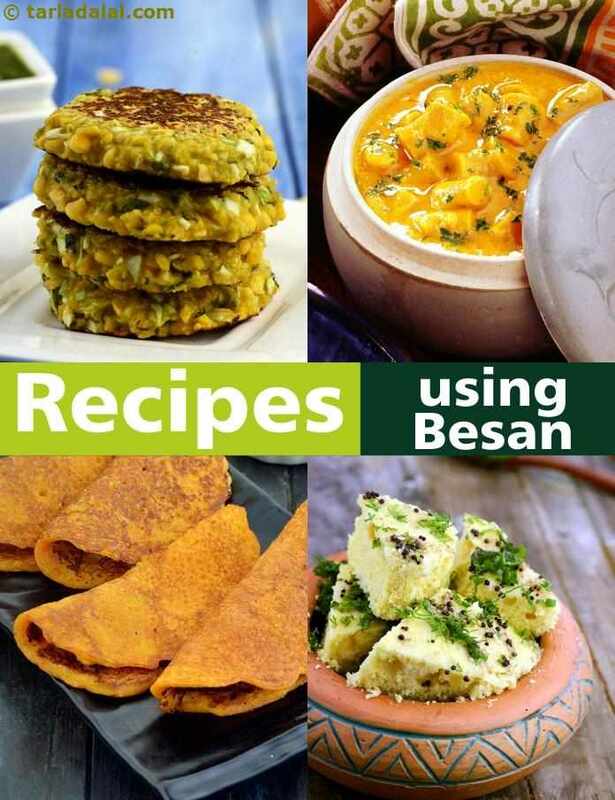 besan indian recipe collection. Besan or gram flour is a pale yellow colored, nutty flavored flour made by grinding Chana dal (Bengal gram). The Chana dal can be either raw or roasted, when roasted it has a stronger flavor which is better than the raw bitter flour. Besan is high in protein content, gluten-free and rich in other nutrients like magnesium, calcium, zinc, and iron. Owing anti-microbial properties, besan is mixed with different ingredients to create a home-made pack that acts as a cleanser in exfoliating all types of skin. You can make besan flour at home by grinding (preferably roasted) Bengal gram in a food processor until the mixture becomes a fine powder. You can store this flour in an air-tight container in the refrigerator for up to six months or in the freezer for up to twelve months. Be it the sweet Gujarati Kadhi, Rajasthani Pakoda kadhi or the Punjabi kadhi, besan forms an integral part in these dishes. Apart from that, besan is used exclusively as the main ingredient in a variety of dishes like pakora, authentic Gujarati snacks like Khandvi, Khaman Dhokla and Rajasthani gravies like gatte ki subzi. Maharashtra's famous batata vada, bhajji pav, pitla, zunka etc. Besan can be used as a thickener in gravies, as a batter for frying,the binding agent in kebab/patty or as an egg replacer. Chickpea flour is very absorbent and can be used as a binding agent while making varieties of appetizers (be it kebab/tikka/patty). Give a healthy twist to the very famous aloo tikki? You can surely munch on them guilt-free. Also, these sprouts tikki can be relished for starter or evening snacks with tongue-tickling chutneys. How about marinating some cottage cheese with curd and dry spices? The addition of besan to the marinade helps in binding all the ingredients together. Relish hot paneer tikka with mint chutney! You can even deep fry some crumbly, melt-in-the-mouth Paneer cheese balls or cocktail-sized vegetable kebab for your next party! It is also used to make an array of dry snacks like South India's ribbon sev, Gujarat's fafda, chakli or fried masala peanut. Escalate your energy levels at the start of the day with these light on tummy, easy to make besan chilla. This protein-packed, low in calories chilla is surely going to lead you to a beautiful day. Try making Lauki chilla which is packed with the succulence of bottle gourd, tanginess of curd and the warmth of chilli powder. If you don't like lauki then flip some tomato omelette. You can savour them with pickle or a bowl of curd. Traditional Indian Mithai recipes made from besan like Mysore Pak, Sweet Boondi and Mohanthal are loved by one and all. Using sweet boondi, you can even prepare delicious Motichoor Ke Ladoo. Other than these Indian sweets like Besan barfi, Besan laddoo, Baked Besan gujiya and Besan sheera are quick and easy to make. You can even make besan laddoo in a microwave oven. In all these recipes, make sure you roast the besan well to avoid a raw smell. An addition of cardamom powder and mixed dry-fruits enhances the taste and texture greatly. You can make these delights for festive occassions like Ganesh Chaturthi and Diwali. They also make a good treat for kids. Enjoy our collection of 1206 veg recipes using Besan and cook new delights every day! Since gram flour is generally known for its thickening properties, besan sheera is very easy and quick to make. You can easily prepare it for functions, party or for sudden but special guests. Just ensure you roast the gram flour well to avoid a raw smell. Also, take care to serve hot. Tarla Dalal Hi, Happy to know you liked the recipe collection. Do try more and more recipes and share with us your feedback.